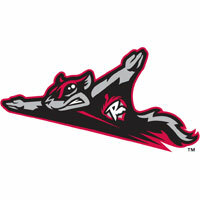 The Richmond Flying Squirrels (36-43) couldn’t hold a 3-0 lead, falling to the Reading Phillies, 4-3, on Friday night at FirstEnergy Stadium. With the victory, the R-Phils took the series from the Squirrels. Richmond has dropped seven of their last eight ballgames. Right-handers Craig Westcott and Austin Hyatt traded zeros through three innings, but the Squirrels struck first in the fourth. With one out, Mark Minicozzi pulled a single through the left-side of the infield. Tommy Joseph followed and belted a 3-1 fastball from Hyatt well over the left-field wall. Joseph’s fourth home run of the season put Richmond in front, 2-0. Westcott was dazzling through six innings, limiting the R-Phils to just two hits and facing one batter over the minimum. Richmond added a run in the seventh when Ryan Cavan flared an RBI single to plate Nick Liles. The run came off of reliever Ryan Duke and gave the Squirrels a 3-0 lead. Hyatt didn’t factor in the decision, departing after six innings, having allowed two runs on five hits. He walked none and struck out five. Reading awoke and rallied off Westcott in the seventh inning. Brandon Tripp rifled a single into right field with one out. Darin Ruf followed and sent a towering-home run to center field to trim the Richmond lead to a lone run. It was Ruf’s 13th home run of the season. Cody Asche then singled back through the middle and Leandro Castro doubled through the alley in left-center field. With the tying run at third and the go-ahead run at second with one out, Westcott bore down. He fanned Sebastian Valle and worked ahead to Troy Hanzawa. However, he hung a breaking ball and Hanzawa smacked it back through the middle for a single. Asche and Castro both scored to put Reading in front, 4-3. Westcott (6-6) was saddled with a stunning loss, his sixth of the season. He was charged with four earned runs on seven hits over 6 2/3 innings. He walked none and struck out seven. Duke (1-0) was credited with the win in his Double-A debut, allowing a run in his only inning of work. Right-hander Colby Shreve worked the final two innings of scoreless relief to finish the ballgame and earn his second save of the year.